3 months passed since that day. Anchan and Shuka remained as friends, the best of friends even but their actions certainly doesn&apos;t say so. They&apos;re as clingy as ever but that&apos;s just how Anchan and Shuka normally are. Regardless of the "cool off" they both communicated like nothing happened. Shuka still couldn&apos;t bear to look at Anchan when she did the flips but eventually she got used to it and even helped Anchan practice it till Anchan finally did it! And now, it was the first day of the Unit Carnival. Everyone was getting ready for it, with the setlist that is foreshadowing 3rd Live. Anchan was now behind the stage wherein there&apos;s only 3 minutes till showtime, she hasn&apos;t felt this nervous before and she didn&apos;t even notice her hands were shaking. Not till Shuka hugged her from behind. "1 minute to showtime! Everyone on their specific places!!" causing the girls to flinch but did as they were told. Everyone did absolutely great. From the opening song to the mc, to performing a few more songs until Miracle Wave finally came. It was still the intermission P.V but all of them could see the staff putting the gym mat on stage. A few more minutes and it&apos;ll be time. Anchan never felt so nervous in her entire life as each second passed by. Going as far as to rub both of her hands together to create friction and heat to her cold hands. It&apos;s even hot out but for some reason she felt so cold. Shuka noticed this and beside Anchan, clasping both of her hands in front of them. "You&apos;ll do great, I promise. 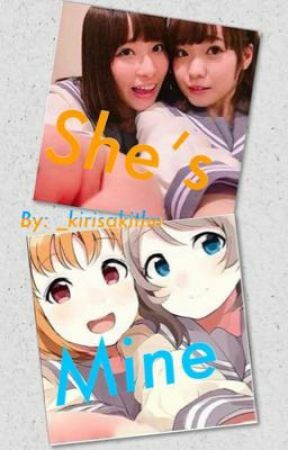 I&apos;ll be right behind you no matter what happens" Shuka said with a smile that reassured Anchan as the said girl nodded in agreement. "Time to get on the stage!" The staff&apos;s shout interrupted their moment. They all sang the song and before Anchan knew it, she was singing her part that leads to the flip. The rest of Aqours did the dolphin dive already. And as if time went into a standstill when Anchan successfully nailed the sideflip. But here comes the hard part. It was as if Anchan was about to have a mental breakdown, felt her mind go blank along with the pause in the music. The entire stadium was quiet, waiting for her to do the flip, when suddenly she felt like drowning in the deafening silence. But then, she heard a voice. "I&apos;ll be behind you no matter what happens" an all too familiar voice Anchan knows too well, the voice whose owner&apos;s eyes she could feel behind, cheering for her. Anchan&apos;s thoughts became straight and before she knew it, she nailed the flip! Happiness is an understatement of what she felt, it was euphoric and not just for Anchan but for the rest of Aqours as well who suddenly felt the adrenaline all throughout their body when their one and only leader nailed the flip and performed like there&apos;s no tomorrow. Even the crowd noticed it and cheered for them at the end of their lungs&apos; capacity. And before they knew it, the song ended. They were all gasping for air, but for some reason they didn&apos;t feel tired. The first thing the group did was hug their leader. It took them a while to break the group hug, about 30 seconds or so and the whole dome just kept on cheering. Once the group broke the hug, the fans just kept louder and louder looking at Anchan who rarely cries became emotionally vulnerable. Anchan who looked at Rikyako and gave her a tight hug as she remembered her performance in the 1st live. After hugging Rikyako, she went to hug Shuka and finally went to talk to the crowd as along the way she asked Suwawa "How was it? Kanan-chan?" Who in returned answered "It was well done, thank you Chika" and gave her a really tight hug that even Suwawa teared up. Everything went well after that and despite the tiredness she feels, Anchan still manage to wear that victory smile as each of the staff congratulated all of them for a job well done. She couldn&apos;t feel any happier. Especially that the moment they stepped backstage Shuka jumped on her and hugged so tight that it took her 5 minutes to take Shuka off of her. She got hugs from the others as well. Then they all ate a grand dinner together to celebrate the success of the Carnival. A lot of talking happened and about each and every one of them was proud of their leader for pulling off the flip. The entire time, Shuka never let go of Anchan&apos;s hand. Even now, as they were preparing to sleep. The both them are the only ones not asleep cause the moment the dinner and some talks ended, everyone immediately passed out in their studio. Anchan settled on the corner with her pillow and a blanket where she usually sleeps. Shuka would be on the other side of the room but tonight was different. "Mind if I sleep next to you?" Shuka asked, carrying her own pillow and blanket. Anchan smiled and nodded and just lied down cause she was in fact, reaalllyy tired. Shuka lied down beside her, both of their backs facing each other. "Hey Shuka?" Anchan whispered with a sleepy tone, careful not to wake anyone up. "Yeah?" Shuka mirrored the whisper and heard Anchan&apos;s yawn. "...thank you..." was Anchan&apos;s last words before drifting off to dreamland. Shuka smiled and got up to look at Anchan&apos;s sleeping face. She brushed away a fringe of Anchan&apos;s hair and fixed Anchan&apos;s blanket and leaned down, brushing her own hair behind her ear. "...no...thank you Anju...you were the best thing that was ever been mine.." Shuka whispered in Anju&apos;s ear and leaned down some more to kiss her cheek before lying down and went to sleep. A/N: And that&apos;s it! It&apos;s been quite a ride but thank you to all who gave this book time to read! To everyone who looked forward to this book, I can&apos;t thank you all enough. It was fun making my first ever book and now, finally ending it. Thank you so so much! !